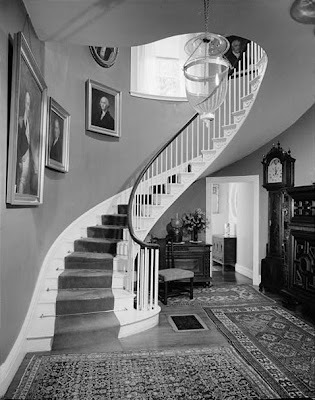 My last post, about the Pierce mansion in Portsmouth, with its lovely hall, brought comments about the complexities involved in building a such a staircase. It does seem to be a lost art, with even high end designers and builders taking shortcuts that result in something flat and unsatisfactory. I remember a having a conversation with the stair builder on a oversized 'colonial' style house being built near where I lived 30 years ago. The house was a huge affair, designed for a fairly demanding client.. One of her desires was a grand curving staircase, a nearly universal symbol of architectural elegance and glamor. 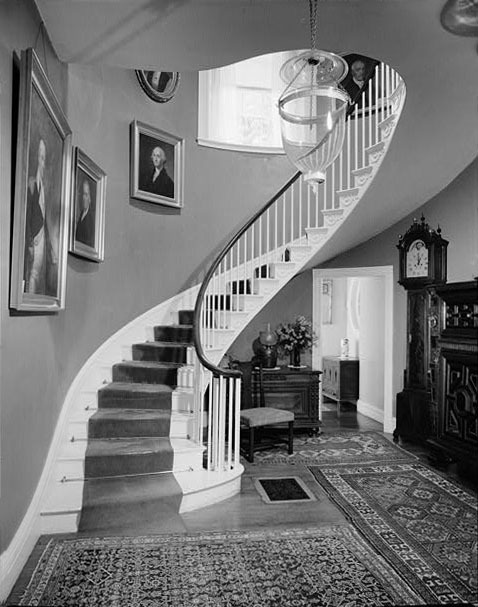 A stair was designed, and like the one in the Pierce mansion, it was recessed in a wall between two doors. The effect, however (in fairness partly the fault of the exuberant interior decoration), falls far short of the Pierce staircase.. The craftsman who built the stairs told me at the time that there were many issues----the architect had not done the math properly, and the stairs in building would not actually land in the proper place. 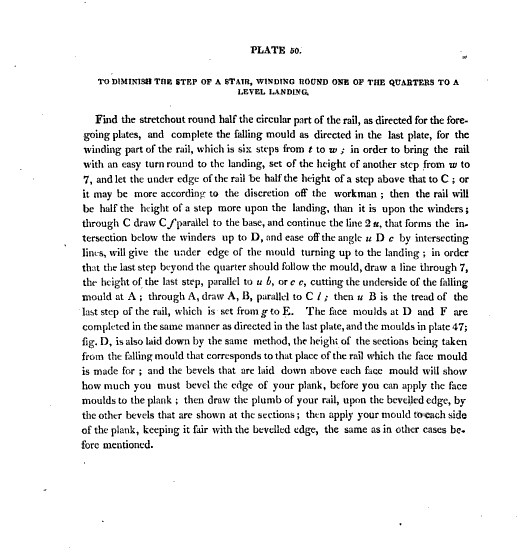 Many adjustments had to be made in the course of construction, and the result, as you can see below was better than many modern circular stairs, but far short of what was being done in earlier times. The very stair in question, looking better than it really is through a fisheye lense. Best not to think to much about the decor. It was the 80's. The program was ambitious. This is actually one of the more calmly decorated spaces in the house. And this opens up one of the anomalies of modern design and building. The architect in question had completed four years of one of the best architectural schools in the country, and acquired undeniable design skills, and had had endless training in mathematics and geometry. Yet he couldn't come up with a proper curving staircase, one that swept in a graceful gravity defying curve to the second floor. 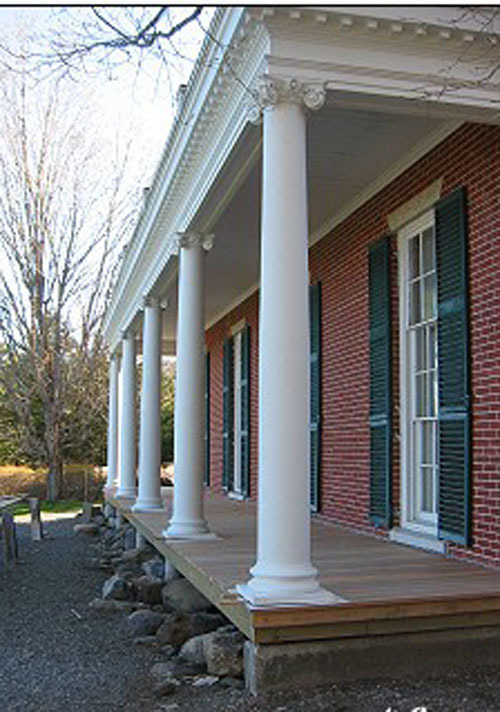 We see it all the time now----graceless stairways, ill proportioned Palladian, or as builders and realtors like to call them, Palladium, windows are a stock standard of 'traditional' home designs. The house above also has one of those ill designed windows, but that's not where this post is headed, so I'll leave that for another day. 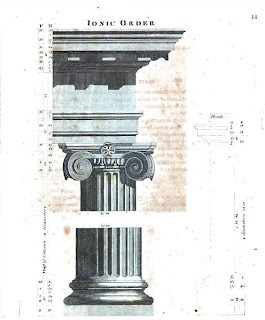 The anamoly is that 200 hundred years ago, in a country with relatively primitive technologies, self trained carpenter/architects, often with limited education, were routinely creating graceful, well ordered buildings using no more than their eye, and the building conventions of the time, aided by several popular builders manuals, chief among them those of Asher Benjamin. 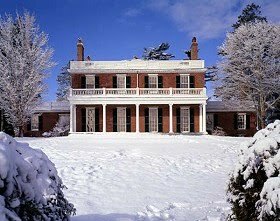 Here is an excellent case study, the John Black house, Woodlawn, here Down East in Ellsworth, Maine, designed from Plate 54 of Asher Benjamin's American Builder's Companion. 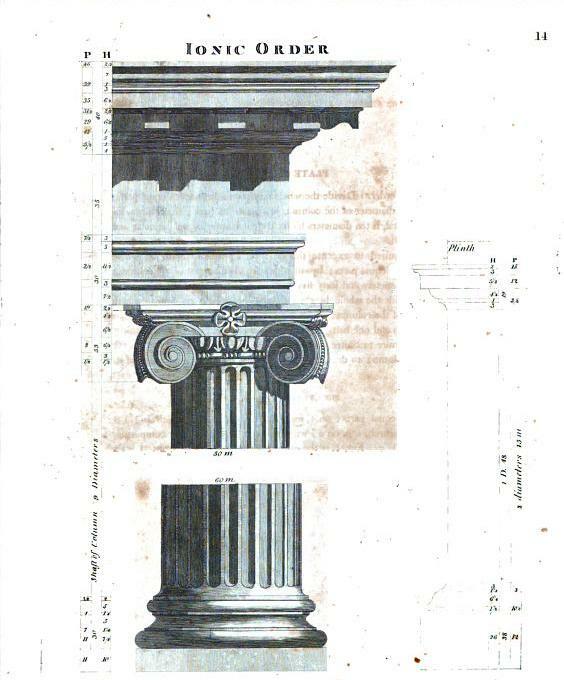 Plate 54 From The American Builder's Companion, published in 1816, inspiration for Woodlawn. John Black was an Englishman, who had been recommended for the position of secretary to one of Washington's Generals, David Cobb, who after the Revolution had come Down East as agent for the Bingham family, who had recently purchased 2,000,000 acres of Maine with an eye to development. Black had been recommended to Cobb by the Barings of Barings bank, who also had a stake in the Maine lands. He did well in his job, in due course married Cobb's daughter, and succeeded his father-in-law as the Bingham's agent. Black became the leading citizen of the area, and in 1827, his fortune secure, he set about to build a house on a hill outside Ellsworth. An architect could have been summoned from the city, given Black's cosmopolitanism and wealth, but instead, he chose a local builder with talent for design, Seth Tisdale, and together, they created an elegant, and for the time, modern, house with a revolutionary side hall plan. And how did they do this? 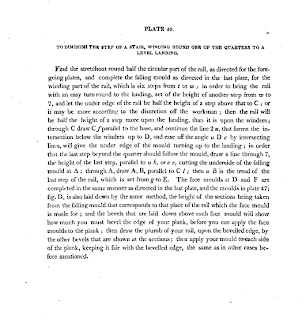 They took a plate from the 1816 edition of Asher Benjamin's American Builder's companion, customized it with details from the book, ordered brick from Philadelphia, and some time later, they had built what was in those times the then grandest house in eastern Maine, elegant, gracefully proportioned, with one of the loveliest curved stairs to survive from that era---all using the helpful instructions of Asher Benjamin. 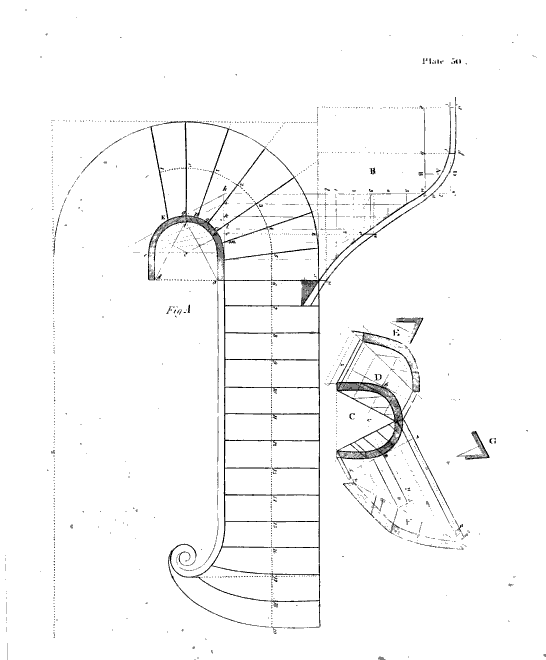 In fact, with the graceful semicircular stair, they did Benjamin one better, replacing the straight upper landing with an s-curve that neatly completes the circle. I don't have a picture available, but the transition of the scrolled stair bracket decoration to the upper landing facing is virtuosic. 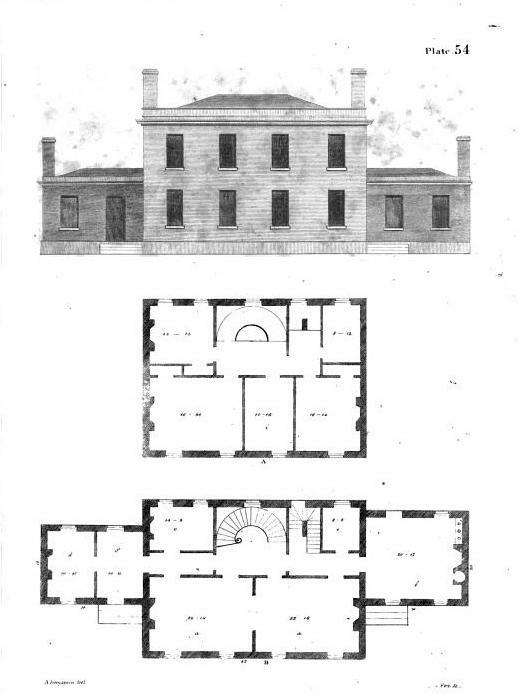 Most of Woodlawn's lovely details, railings, door casings, mantels, balustrades, interior shutters, can all be traced to designs chosen from Benjamin's book, and the finished result shows just how far a talented builder could go, with a set of rules to follow in gauging proportion and detail. 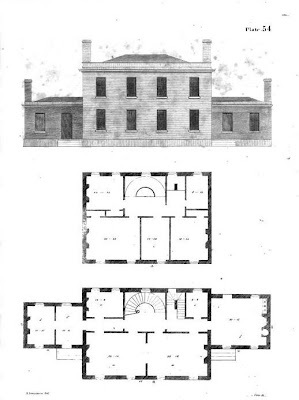 In copying Benjamin's design, the floorplan was followed exactly, but the elevation was tweaked, with triple hung windows reaching to the floor from the drawing rooms, and portico along the front of the central block. What a huge difference from today's builder houses, with their 'one of everything' from the window catalog. What we have lost from average building in recent years is proportion and grace, whatever architectural style is being essayed. I can think of a dozen other houses around here from the early 19th century with surprisingly lovely and sophisticated staircases---the Ruggles House at Columbia falls is a particularly fine example---and so it remains until the 1940's. 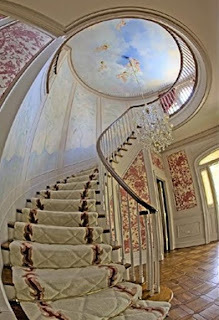 And from then on, I cannot think of a house, no matter how well designed, or expensive, that has a really worthy stair. It's a mystery to me. 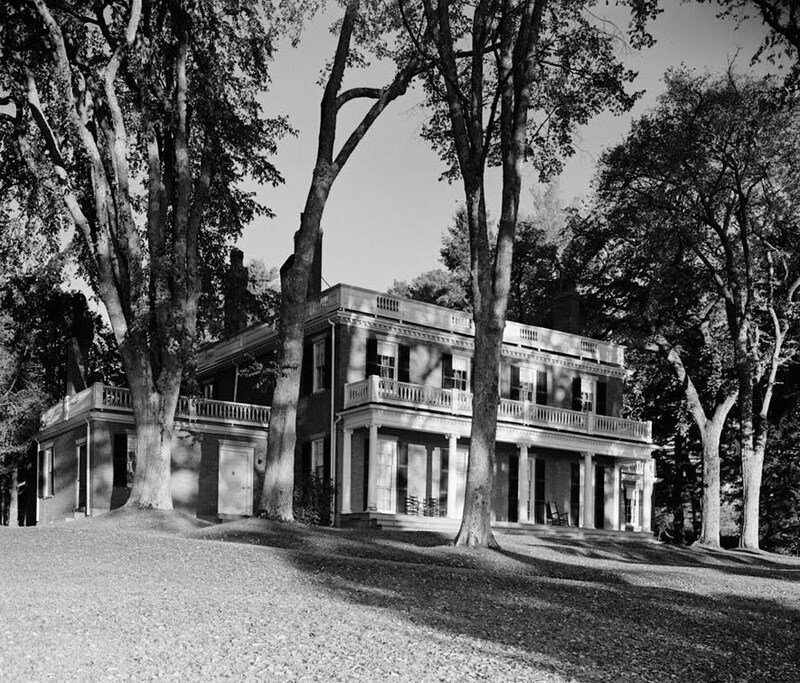 John Black's grandson, George Nixon Black, who used the house only in the spring and fall, died in 1927, leaving Woodlawn, its expansive park-like grounds, and three generations of family furnishings to the Hancock County Trustees of Public Reservations, who administer it as a house museum and park. The house's lovely furnishings are as Mr. Black left them in 1927. For more information, visit the Woodlawn website http://www.woodlawnmuseum.com/ It is one of half a dozen exceptional historic houses to be visited in this region. 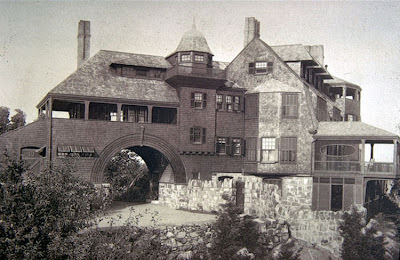 Incidentally, the last Mr. Black, in addition to his munificent gift of Woodlawn to down east Maine, was also a major benefactor of the American collections at the Museum of Fine Arts in Boston, has also achieved immortality in architectural history for having commissioned one of the most admired houses of the shingle style, his summer home at Manchester Massachusetts, designed by Peabody & Stearns. This is definitely not a house out of the pattern books, and is a virtuoso performance by young architects at the beginning of their successful practice. Kragsyde was demolished in 1929, two years after Black's death, but interestingly, a copy has been built, reversed from the original plans, on Swan's Island, not 25 miles from Woodlawn. I think a big difference is that your friends staircase isn't open underneath but enclosed; Probably hiding either a closet or stairs down to the basement -right? Not to place blame (and don't start in on us architects!) but unless a client wants to spend oodles of money, you are stuck using 'stock' pieces for the most part which leaves things relatively 'flat' as you suggest. 200 years ago, before the industrial revolution, each piece was hand turned or cut and not stuck to 2x4 dimensions which can be limiting even if you're working with a master craftsperson. An interesting topic for conversation! I agree, and in no way am slamming architects (without whom we could not exist)in this one, and am well aware of the shifts and limitations of modern times and materials. In this particular case, the client did have oodles (and oodles) of money to spend, and a custom builder was brought in, and still the result was mundane. Notice that the Pierce staircase is also enclosed underneath. Quel difference, no? I do however, belong to the school of keep it simple if it can't be done right---a nice modern straight stair of industrial parts vs. a bad stair of wannabe design in stock parts? And indeed an interesting topic, thanks for getting the conversation started (incidentally, I've added a couple of paragraphs to the piece since you commented. Something else occurred to me. Oh, sorry - I was comparing it to the beautiful staircase at Woodlawn you show in the article :-) My mistake! I appreciate the conversation. 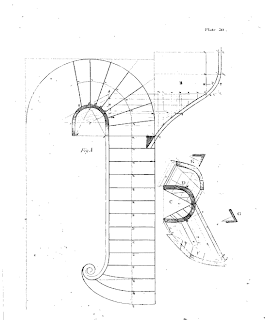 It is true such marvelous stairs in the air were built before autocad and calculators. Now we are lucky that the stairs meets the rise. I have built two stone stair cases, and yes getting the stairs to meet the rise is often difficult. But, hey, I am a 60 year-old woman doing my own work here. I understand Stefan's position what was built in the past was milled to fit, and now it is stock and dwindling quality of stock at that. I posit perhaps a different thought: in the very distant past, geometry and sacred geometry at that, was seen as godlike and worshipped. I think they wore the "magical math" inside of them and made it apparent in their work. There is no sense of wonder or appreciation in the harmony of sacred geometry these days. What a fascinating post, I am learning all sorts of things about American architecture, I must explore your blog more. And you use the blog format so well, moving from the specific issue of curving stairs to a discussion of different historic houses. Your comments on other blogs have been funny and sharp and charming; I hope your range of topics here expands, to let you show off those talents more. A wonderful subject for a post...and your photos of Woodlawn are lovely. A staircase always elicits an emotional response. Often the first thing ones sees in a building...burglars creep up them, brides descend to waiting grooms, Scarlet O'Hara fell down one, thwarted lovers throw themselves over the railing and ghosts make the boards creak! Bravo! I've visited the replica Kragsyde on Swan's Island - a labor of love. There are some great photos of the house in the book "Shingle Styles" by Roth and Morgan. Marvelous post. It raises that nagging question, as you say, about the wisdom of whether to attempt great style or to keep it simple if it cannot be done right. Those of us who revere the architecture of fine old houses are both inspired and depressed by the skills of builders past. That "sacred geometry" that Home refers to, seemed to be respected by provincial or itinerant craftsmen, so that even the simplest houses feel inexplicably "right". Asher Benjamin~wasn't he a source for much of Gil Schaffer's work? Now, there's a present day architect who'd get a curving staircase right. Anonymous, elaborate more. My chosen range is architecture, landscape and design, mostly in Maine and New England, but open to suggestions. Toby W, Gil Schaffer is a perfect example that Asher Benjamin still has a few tricks to teach. Thanks for your post on Woodlawn. I enjoy your blog a great deal. Those staircases move me to weep. At one time I struggled with some of the considerations you bring up. I bought a house with the sole purpose of renovating an ugly duckling into the pervertible swan. What drove me was the idea of visually being both inside and outside of a building and being able to not only see into but to see completely through the walls like the Philip Johnson House and The Foxworth House - that kind of transparency. My inspiration came from the The Buckwalter House designed by Hugh Newel Jacobsen. He used glass between all the framing members on the gable end. Twenty years later I used the newer technology of a glass curtain wall to achieve a similar "house" icon and the result ended up on the front page of the Sunday Washington Post. About which I was quite puffed up. When deciding to do my version of a "glass house" in the end I realized that the stunning architecture of the classics can not be topped. They were the Masters. If one is going to go on in the genre one must take up a new mentality.